Home Office Update…and a giveaway winner! Happy Monday Friends! I am excited to announce the winner of the Elle Elyse handbag and personalized artwork…Darlene at My Honey Bunch! Yeah Darlene! You may remember a few weeks back I posted my Home Office makeover…I was on a roll…cleaning out, decluttering and organizing for the first few weeks of the year. I might have gotten a little off track. Oops! This weekend, I got a little closer to finishing the room. The wall above the desk looked like this: Blank. And. Boring. Mr. Kriegerchick and I toyed around with a few different ideas for what to do with that wall. I wanted shelves to “store stuff” and display pretty things…He did not want any additional “stuff” in the room, holes in the walls, or to spend anything. We both got what we wanted out of the wall…Display space for me. Only 4 holes, minimal clutter and FREE for Mr. Kriegerchick. 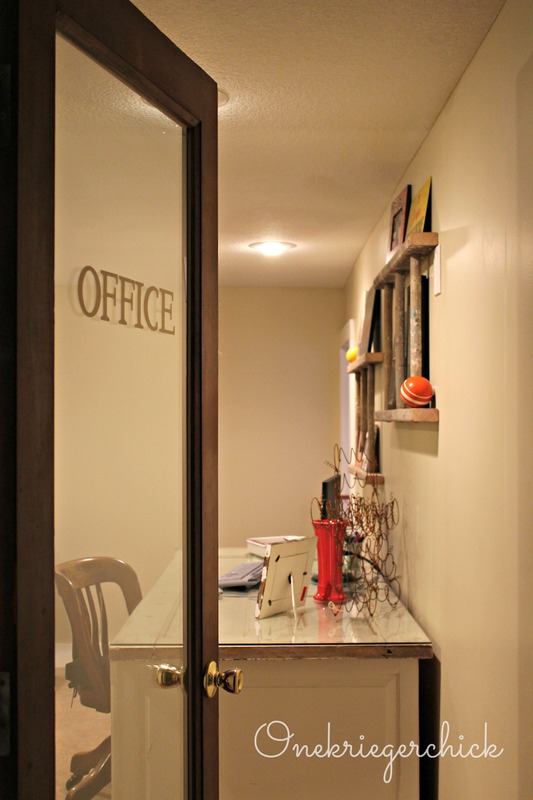 Of course, I could not leave the door alone either…I love the glass door to the office and just to up the cuteness factor…I might have added a vinyl OFFICE decal. It was super easy…I cut out the letters on my Cricut. Drew a line on the door with a dry erase marker to use as my guide. Then very carefully applied the vinyl letters. Now, the room feels more finished and definitely has more personality! Yeah…I LOVE checking projects off the list! 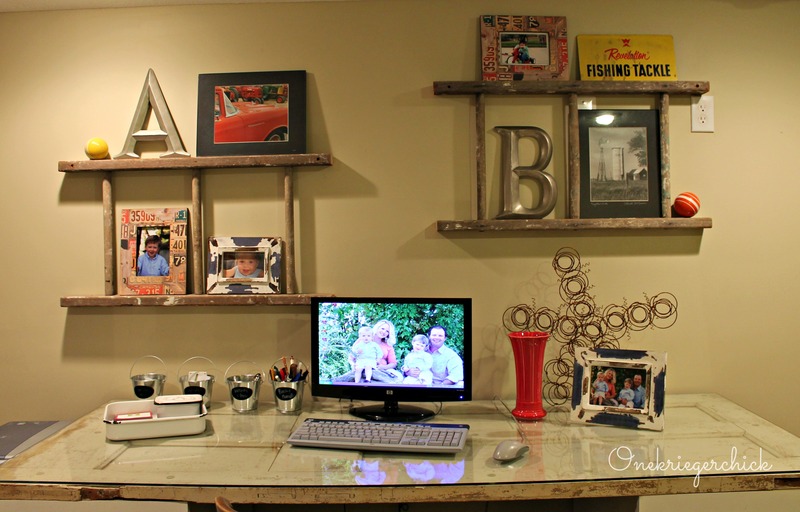 Love to hear about the FUN ways you are using your wall spaces! using a ladder for the shelves was genius!! Thanks! I’d love to see what you come up with for your door! I’m pretty lucky to have a handy man who goes along with my ideas! The door looks Great! 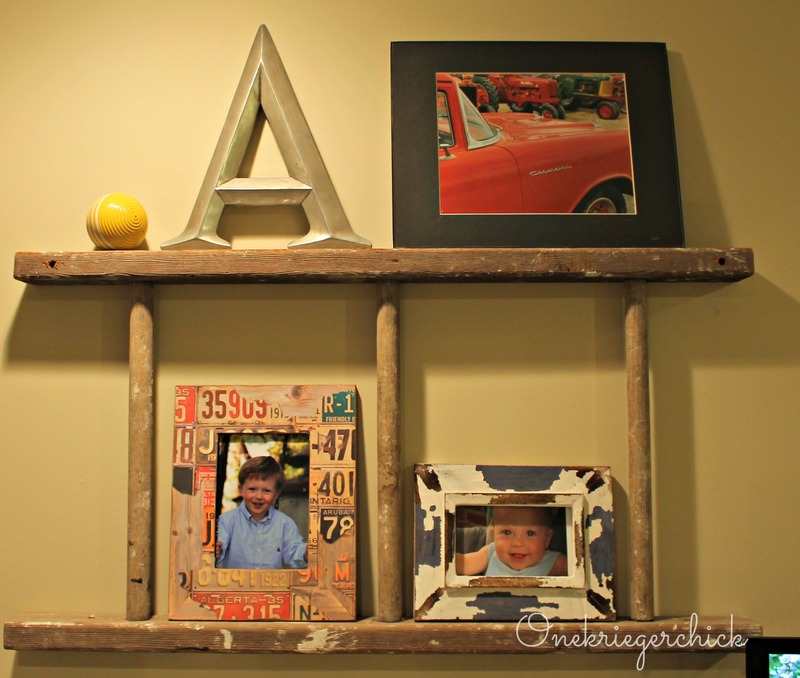 I love the ladder, cut and used for shelves! Looks good – very creative! Now come de clutter my office!!! Thanks Laurel! You should see the craft room next door…Looks like a tornado swept through! Love that idea…I need a towel bar in our basement and the ladder would be perfect! Thanks for visiting! 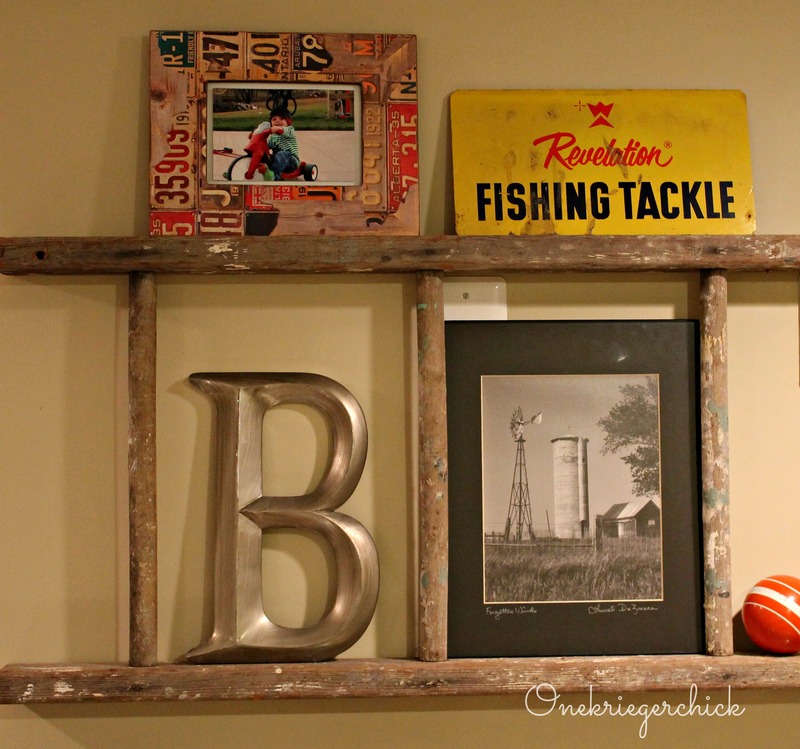 You have some really fun home decor ideas! Your ladder shelves are fabulous. I also really admire the ‘Office’ on the door, and your spring-star. Thanks for linking to Take-A-Look Tuesday over at http://www.SugarBeeCrafts.com – you were featured today! Love the ladder used for display. I am considering that idea for our guest bed room make-over. New follower. Thank you so much…So glad you are along for the ride! What a beautiful I just started a new link party and would love for you to come over and share this post or any social media sites. http://designeddecor.com/talkin-about-thursday-link-party-9/l space! I love how you cut the ladder to make smaller shelves! I linked up…Thanks so much for visiting! It looks fantastic! I love the use of the ladder! Thanks so much for sharing at Real Family Fun link party. The ladder is such a great idea! And I love your labeled door Thanks for sharing at the Point of View party!